Sessions are held at your location of choice - and there are lots of choices that I am up for. Let's do something different! What about a field or an urban setting, the beach or even your home? I like for you to book at least 3-4 weeks in advance, but if you are inquiring last minute please don't let that stop you from contacting me. I may be able to fit you in - there are always changes in the schedule, but don't be surprised if I don't have anything. Session fee is $100 for up to 4 people in Horry County. Please click HERE to see my pricing list. Please note for future orders: All ordered images will be archived. All unordered images will be purged 4 weeks after your order is placed. Purchasing your proofs will ensure that your images are saved. Family/Child Sessions can last from 45 minutes to 1.5 hours depending on the location and number of subjects. I will not rush you, expect a relaxed atmosphere. I may act silly - you may see or hear me do silly things....it's okay, I am normal. Newborn Sessions are longer to allow times for feeding and changing, and can last anywhere from 2-4 hours. The best time to schedule your newborn session is while you are still pregnant. I love to do a newborn session the first 2 weeks of life (one week preferably) - that's when baby sleeps the longest and hardest and I can get some really cute sleeping shots. I have everything I need, however I am open to any ideas or props you may have. Senior Sessions should be scheduled the summer before the senior year. Please do not wait until the last minute to schedule your senior portraits. The fall is a very busy time of year and I may or may not be able to fit you in if you wait. Senior sessions are around 2 hours/different locations if you prefer and outfit changes are allowed. Weddings. 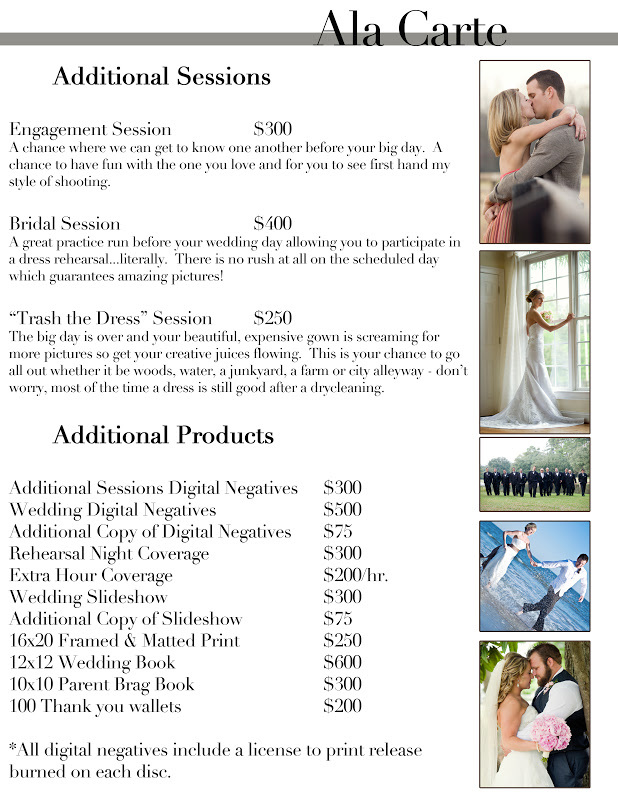 If you look under INVESTMENTS on my website....there is INFORMATION ABOUT WEDDINGS that you may want to look at. It's important that you are familiar with my work so please take some time to browze the wedding gallery on my website as well. Also I shot a small wedding on Fripp Island. Here's a LINK TO A VIDEO that I put together to show some highlights of that day. 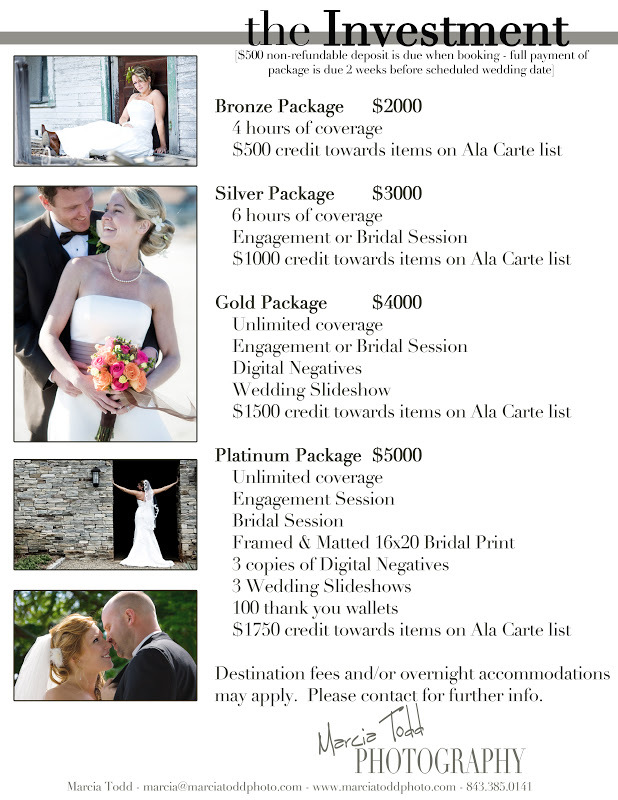 Below are my wedding rates for you to review. Of course, please contact me with any questions you may have b/c the packages are customizable to a certain degree. For example, you may need the Bronze package for the coverage, but you may not need the bridal session...we could substitute extra coverage or another Ala Carte item. If you are ready to speak with me or take the next step, just let me know!